A legal description is a written way to describe a piece of property that is recognized by law and is sufficient to locate the property without oral testimony. 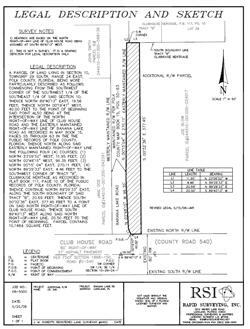 Generally included with the legal description is a sketch that illustrates the written description with bearing lines and distances. The legal description and sketch is a legal document only. A LEGAL DESCRIPTION & SKETCH IS NOT A SURVEY. 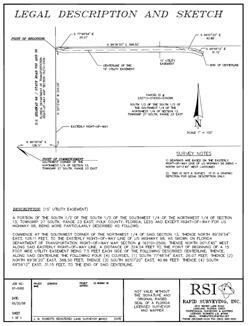 Describe an easement for utilities, drainage features, public access, etc. Rapid Surveying will provide our clients a professional legal description that a future surveyor, real estate lawyer and or title agency can easily follow.